One of the greatest American singers and actresses of her generation looks back on a magical and turbulent life spanning a half century of theatrical history from the golden age of the Broadway musical to the present day. A legend of the American theater, Barbara Cook burst upon the scene to become Broadway’s leading ingénue in roles such as Cunégonde in Leonard Bernstein’s Candide, Amalia Balash in Jerry Bock’s She Loves Me, and her career-defining, Tony-winning role as the original Marian the librarian in Meredith Willson’s The Music Man. But in the late 1960s, Barbara’s extraordinary talent onstage was threatened by debilitating depression and alcoholism that forced her to step away from the limelight and out of the public life. Emerging from the shadows in the early 1970s, Barbara reinvented herself as the country’s leading concert and cabaret artist, performing the songs of Stephen Sondheim and other masters, while establishing a reputation as one of the greatest and most acclaimed interpreters of the American songbook. Taking us deep into her life and career, from her childhood in the South to the Great White Way, Then and Now candidly and poignantly describes both her personal difficulties and the legendary triumphs, detailing the extraordinary working relationships she shared with many of the key composers, musicians, actors and performers of the late twentieth century, among them Sondheim, Leonard Bernstein, Elaine Stritch, and Robert Preston. 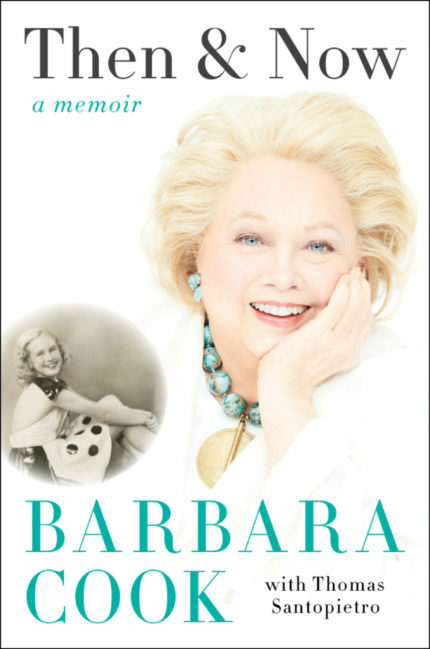 Hailed by the Financial Times of London as “the greatest singer in the world”, but preferring to think of herself as “a work in progress”, Barbara Cook here delivers a powerful, personal tale of pain and triumph, as straight forward, unflinchingly honest, and open hearted as her singing. Theater rats will savor Ms. Cook’s account of her ‘Candide’ audition in front of the show’s composer, Leonard Bernstein . . . It’s clear in every word she sings that her wisdom is deep and hard-won. …narrated with the same homey bonhomie that has informed Ms. Cook’s stage patter in recent years.